Every missionary who has ever lived has been inspired by the famous ‘Great Commission,’ spoken by the resurrected Jesus in Matthew 28:19-20: “Go therefore and make disciples of all nations, baptizing them in the name of the Father and of the Son and of the Holy Spirit, and teaching them to obey everything that I have commanded you.” Of course, we have a right to be skeptical that a dead man came back to life to give orders, but there are other reasons as well for suspecting that Jesus—even while he was alive—didn’t say this. Did he change his mind after the resurrection? Or had the compulsion to ‘make disciples of all nations’ come along by Matthew’s time, certainly under the impact of Paul’s zeal as well. This is a measure of the new cult’s hubris and delusions of grandeur. This never seems to dissipate; it is displayed by today’s fanatical sects, e.g. the Mormons and Jehovah’s Witnesses—“we gotta convert the world”…or at least rescue the remnant. In fact, the text in Matthew 15 is the author’s reworking of a story found in Mark 7, which is the focus of this article, one of a series on each chapter of Mark’s gospel. The Introduction to the series, “Getting the Gospels Off on the Wrong Foot,” is here. The article on Chapter 6, “Jesus and His Team of Traveling Exorcists,” is here. We can see from this episode that Mark Chapter 7 doesn’t break the pattern of superstition and magical thinking we’ve found all along in this gospel, i.e., belief in demons and healing by…well, by what this time? Telepathy? Other healings have been done by voice activation and touching. And surely Jesus loses points for comparing the woman and her daughter to dogs. Of course, Christian apologists come to his defense. In his 1965 commentary on Mark, C. F. D. Moule noted that Jesus, “deliberately concentrated, in his lifetime, on the Jews alone.” But, even so, “…can we imagine Jesus refusing anyone in need?” But that’s exactly what he had done initially. Moule’s use of the word “imagine” brings to mind Bart Ehrman’s suggestion that Christians worship the “ideal Jesus of their imagination.” His Jesus couldn’t have done anything bad. Moule also tries to put himself into the situation, as if it actually happened. “…something depends on the tone of voice in which he made the protest and the look in his eye at the time.” So…maybe Jesus was just kidding with her? It is so common to take the Jesus stories at face value, but how do we know where the author got his information, forty years after the fact? What were his sources? There we draw a blank, and it’s no good assuming that memories of a real event are preserved here. Perhaps Mark’s point in including this episode was to illustrate Jesus’ magical power over demons, even if they are far away; his initial refusal to help a Gentile was minimized. We should analyze these stories at face value because that’s how most Christians want to understand them; and in so doing, we can expose the absurdities and contradictions. 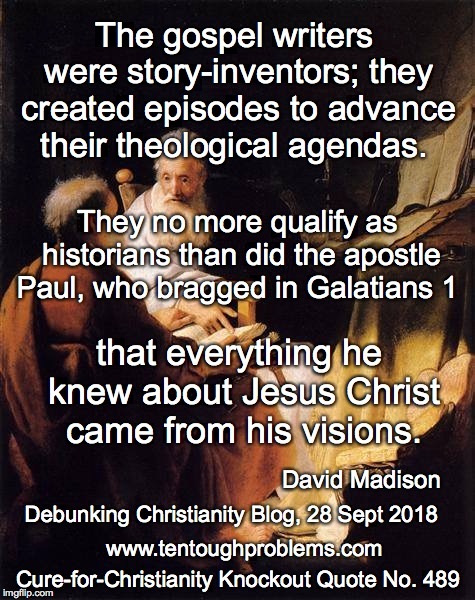 But then we move on, as most serious thinkers do, to grasp that the gospel writers were story-inventors; they created episodes to advance their theological agendas. 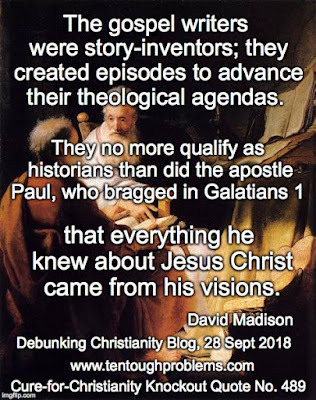 They no more qualify as historians than did the apostle Paul, who bragged in Galatians 1 that everything he knew about Jesus Christ came from his visions; he didn’t rely at all on reports derived from human origins, i.e., people who had actually known Jesus. By the time the gospels were written—well after Paul—it would have been much harder to dig up ‘real’ information about Jesus. As scholar A. N. Wilson has remarked, they wrote theological novels. The gospel authors wrote to address the needs, concerns, and worries of the early Jesus cult. The bulk of Mark 7, vv. 1 -23, cast in the format of a debate between Jesus and Pharisees, is designed to make the case that some of the Jewish traditions were of no value and could be ignored. There was a struggle for self-definition as a breakaway Jewish sect. At the opening of Chapter 7 we read that the Pharisees were surprised that some of Jesus’ disciples ate with ‘defiled’ hands, i.e., they didn’t wash their hands before eating, thus breaking with the ‘traditions of the elders.’ This practice derived, not from concern for germs, but from fear of ‘defilement,’ i.e., contact with Gentiles or food purchased at a market, rendered one ‘unclean.’ Washing could take care of that. But Jesus didn’t buy the idea. He quoted a text from Isaiah (29:13) to put the Pharisees in their place, and, in the middle of the chapter, he explains privately to the disciples that a person is defiled by what comes “from within, from the human heart.’ He lists “…fornication, theft, murder, adultery, avarice, wickedness, deceit, licentiousness, envy, slander, pride, folly. All these evil things come from within, and they defile a person.” I have noted the dearth of great moral teaching in Mark, but in this text Jesus comes close, although there is hardly anything profound in this routine list of sins. Perhaps the most puzzling section of Chapter 7 is vv. 9-13, in which Jesus mentions an oath by which people can get out of supporting their parents: “But you say that if anyone tells father or mother, ‘Whatever support you might have had from me is Corban’ (that is, an offering to God)—then you no longer permit doing anything for a father or mother…” Anything that would let people escape this obligation would, in effect, “makes void the word of God.” We can’t fault this as a moral teaching, but elsewhere Jesus is far less noble, and indeed falls far short of being a great moral teacher. How can anyone be given back mothers, children and brothers a hundredfold? But the most alarming text of all, which has caused so much anguish to apologists and pious translators, is Luke 14:26: Jesus insists that hatred of family is a requirement for following him. The concluding section of Chapter 7, vv. 32-37, is another episode in the Chronicles of Jesus the Magician. In this scrap of folklore, Jesus heals a man who is deaf and has a speech impediment. He put his fingers into the man’s ears, applied his own spit to the man’s tongue, looked to the sky and sighed. “And immediately his ears were opened, his tongue was released, and he spoke plainly.” The crowd went wild: “They were astounded beyond measure, saying, ‘He has done everything well; he even makes the deaf to hear and the mute to speak.’” Mark was playing to his crowd, of course, reinforcing the superman status of the cult hero. But this handling of scripture is dishonest. It’s a better idea instead to put all the good-Jesus stories in one column, then put all the bad-Jesus stories in another—taking care not to be swayed by apologists who work so hard to rationalize the negatives. Carefully weigh the data in both columns; this can be painful—depending on how much you’ve been taught to love your Jesus—but it takes readers one step closer to apportioning belief to evidence.